Caption: A Brilliant Male Monarch Butterfly (Danaus Plexippus) happily opens his wings as he feeds on the sweet nectar of Dense Blazing Star (Liatris spicata). This is one of my favorite photos of the monarch butterfly male. I like how the bright orange wings stand out from the darker red/green background. 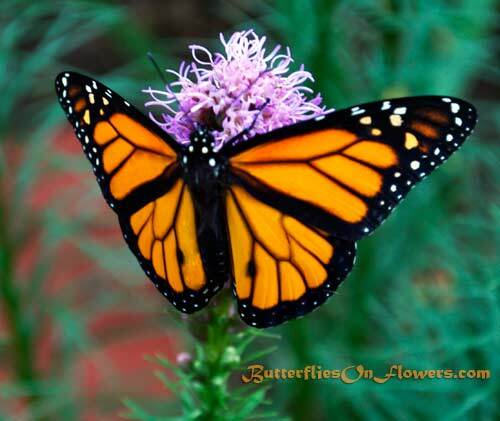 My plan is to attract more monarchs to our butterfly garden next season by adding meadow blazingstar (liatris ligulistylis). I saw this amazing monarch magnet two years ago in someone's front garden, and then on the Minnesota State Fair grounds. Both times I witnessed at least a dozen crazed butterflies that had truly found their heaven. I've never seen that kind of fervor over other liatris species. Monarch Butterfly facts: Each summer, the 5th generation of monarchs will come together at their overwintering sites in Mexico. Only the females will make the return trip to North America. The males die soon after mating, leaving a dense black & orange carpet across the Mexican forest.